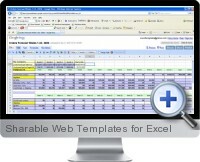 Google Docs Sharable Web Templates for Excel allow you to create, share and update business and financial spreadsheets interactively online with your colleagues. Users of your Google Docs account can be out of office, on the road in fact anywhere and they will have exactly the same access to common work spreadsheet document as everyone else. A Excel File Size Reducer add-in is also included. Google Docs spreadsheets are limited to uploading files of 1MB or less. The Excel File Size Reducer reduces your Excel file sizes down to the very minimum possible, in some cases by a factor of 10. This allows otherwise impossible uploads to Google Docs to work with the greatest of ease. Google Docs Sharable Web Templates plus the Excel File Size Reducer for your own files will make your Excel output much more productive than before. Google Docs Orders Report: Interactive daily confirmed order updating daily by region, customer or sales exec. Combined orders results shared online with authorized colleagues. Google Docs Sales Forecast: Interactive weekly sales forecasts by region, customer or sales execs with pipeline probabilities. Combined sales forecast reporting confirmed orders and pipeline totals. Google Docs Results Report: Interactive monthly results updated online by region or profit center. Combined results shared online with authorized colleagues. Google Docs Inquiries Report: Interactive daily entry and sharing of all sales inquiries. One combined inquiries report created and shared by all members. Sort, filter inquiries report by geographic, sales exec or product type. Google Docs Collections Report: Daily updating and sharing of accounts collection report for action by account managers. Actions and feed back reported online. Google Docs Cash Report: Interactive cash flows by region or profit center. Consolidation of cash flow inputs. Google Docs Quick Budget: Interactive 12 months budgeting for collaborative inputs and sharing calculations of combined budget results plus added value per employee, gross margins. Google Docs Quick NPV IRR Cash Flows: Interactive sharing of net present value and IRR tables and quick calculations. Google Docs New Project Evaluation: Interactive sharing of new project forecasts online with ROIC, NPV and IRR calculations. Collaboration between members is enhanced. Google Docs Promo Pricing: Interactive collaboration and sharing of price/demand tables and charts. Use as a shared learning tool as well. Google Docs Costing Templates. Interactive sharing of costing calculations. Includes standard costs, cost drivers, ABC exercises. Use as a shared learning tool as well. Google Docs Instant Financial Plan: Interactive 12 months income/costs forecast, creates online balance sheets, income statement and cash flow forecasts. Use in collaborative mode with authorized persons (Select authorizations within your Google Docs account). Google Docs Out of Office: Wherever your personnel are they can report out of office absences, date out, due back, locations to share with other colleagues. Google Docs Intelligence Report: Wherever your personnel are they can use this template to report information and intelligences of potential value to your organization with instant online sharing. Excel filters highlight subject topics. Google Docs Notifcations: Interactive sharing information with colleagues. Updating and collaborative information pooling. Plus the Excel File Size Reducer Add-In: the Essential file size reducer if you work with Google Docs spreadsheets. You can download a combined zip file now or order the CD edition.